“We leave our kit and pack in the cloakrooms – and with leave pass in hand, for now we are free men; but what to do? Where to go? This question is answered, for there upon a door is a mystic sign ANZAC Buffet, we push open the door and look in, and lo! London is forgotten for there around us are Australian faces.” Ellis Silas 16Bn. A.I.F. 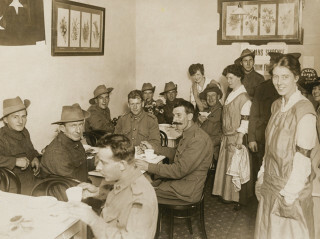 First stop for Australians once their leave had begun was the ANZAC Buffet which was established by Minnie Rattigan of the Australian Natives Association. Minnie was born in 1870 at Barooga Station, Australia and married her second husband Alan in 1912 before they emigrated to London. On the outbreak of war, in 1914, Alan joined the 1st Life Guards as a Second Lieutenant interpreter and with her husband away Minnie decided late in 1915 to open the ANZAC Buffet at 130 Horseferry Road. This was a place for Australian servicemen to find a home from home during their breaks from active service and offered free meals, entertainment and the chance to forget the horrors of war. The Buffet was open seven days a week from 6:00 a.m. to 10:30 p.m. and employed an army of Pimlico women to feed about 1000 men per day. In addition to serving meals, the ANZAC Buffet had billiard, reading and music rooms and organised entertainments for the troops. On one such occasion, on the 20th November 1915, the ANZAC Buffet played host to six Australian and New Zealand Victoria Cross recipients including Paddington born Leonard Keysor. In September 1916, the Buffet was relocated to 94 Victoria Street officially because the original premises were required by the military. However, Minnie Rattigan believed it was because the army did not want competition for their newly opened Australian Soldiers’ War Chest Club located nearby. This new club charged for meals and other comforts, while the Buffet continued to provide free meals and entertainment throughout the war. In 1916 Australia’s Pimlico born Prime Minister Billy Hughes came to Horseferry Road. 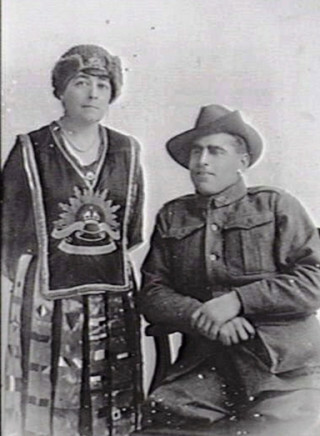 In addition to visiting his old school, St Stephen’s (Burdett Coutts) he came to both the ANZAC Buffet and War Chest Club to pay tribute to women like Minnie Rattigan who were ensuring that that a warm welcome was always on the menu for any visiting ANZAC. This page was added on 15/12/2015.